How is Digital Music Created With DAW Software? DAW Software: How is it Used to Make Music? If you've only ever listened to digital music, but now want to start creating it then you'll need to use a DAW -- short for digital audio workstation. It might sound complicated, but it just means an audio set up that can create music (or any sound) in a digital way. A DAW is usually a combination of both software and external hardware (like a MIDI keyboard), but it doesn't have to be. 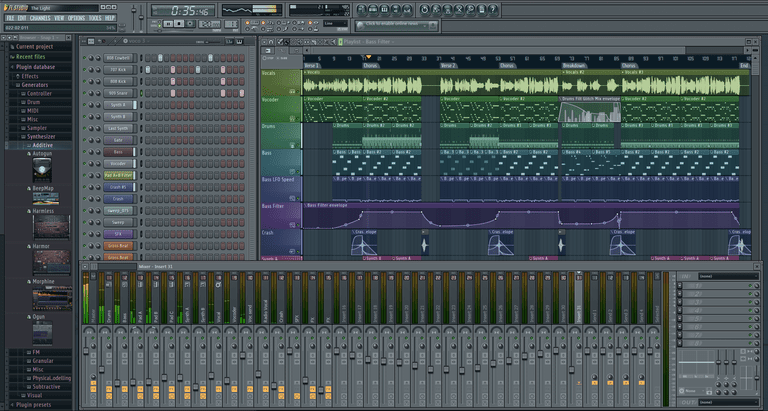 When first starting out in digital music creation, you can keep things simple by using just a software DAW. This can be run on your computer, tablet, or even a phone. A DAW can be thought of as a collection of audio tools. It gives you all the facilities to make music from start to finish. The components of a DAW enable you to record, edit, sequence notes, add effects, mix, and more. How are They Used to Create Digital Music? You'd think that all software DAWs are pretty much the same, but there can be big differences in how they work. Some, for instance, focus more on the use of audio loops to create music (like GarageBand). These use pre-made samples which can be 'stitched' together to create a piece of music. Sample packs can also be downloaded or purchased on DVD to give you hundreds more audio loops to play with. Other DAWs such as Steinberg Cubase, FL Studio, Pro Tools, and Ableton Live, use a combination of different techniques. As well as audio loops you can use plug-ins which emulate real instruments. Sequences of notes (MIDI) can then be used to create the music. When DAWs were originally available to buy in the 1970s they were solely standalone systems. They also came with a hefty price tag too which put them out of reach for most people. This was due to the high cost of the electronic components at the time such as the CPU, storage media, VDU (visual display unit), etc. However, since the late '80s/early 90s, home computers (and tablets like the iPad) have become so powerful that they can be used in place of dedicated hardware. Setting up a DAW in your home is now a reality rather than a dream, it costs a fraction of what it did before the dawn of the computer age. Are There Any Software DAWs That Are Free or Open Source? Yes, there are. These are great to try out before moving on to paid-for DAWs which can cost several hundred dollars. What are The Basic Hardware and Software Components of a DAW? A computer or portable device running DAW software. Audio interface (for recording audio and outputting sound). With the advances in mobile computing, devices like the iPhone, iPad, and Android are now being taken more seriously as a way to create digital music too.